Turning your TV into a workstation is already feasible today. The days of the single-function television are dwindling away. With the introduction of USB ports into TVs and the release of USB dongle devices into the market, it’s becoming even more common to integrate PC capabilities into TVs. As the use of USB dongles grows, TV computers may soon be a fact of life. Rikomagic’s MK802 II brings this future closer to a tangible reality. 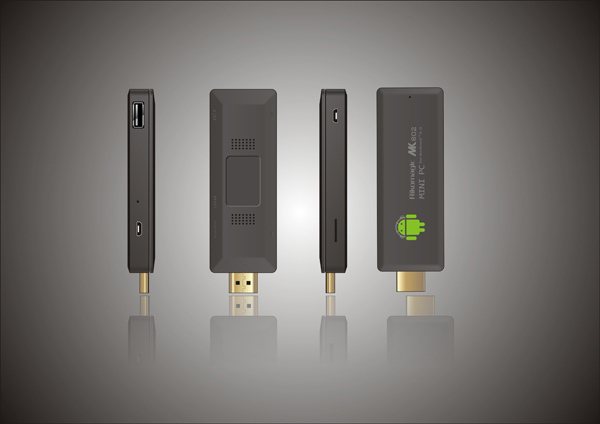 The Rikomagic MK802 II PC-on-a-stick is one of these USB dongle devices that add computer features to TVs. Powered by an Allwinner A10 single core processor that has been paired with the Android 4.0 Ice Cream Sandwich OS, the MK802 II’s technology is already at par with that of smartphones. Add in three USB ports, a mini USB port, a microSD card slot, and a full size HDMI port — you’re already looking at a miniature version of a laptop. That’s a very impressive feat, considering that the MK802 II is just about the size of a standard USB drive. On the hardware side of things, the most impressive feature of this PC-on-a-stick may be the HDMI port. HDMI ports, after all, come standard with HDTVs, and the inclusion of the port in the MK 802 II means that there’s an extra USB port free. In the age of downsizing laptops equipped with only two or three USB ports, techies and normal users alike know very well the importance of having just one more port free. As a bonus, an HDMI port in the MK802 II means that you can just plug it straight into your TV, cable-free and, by association, tangle-free. If the HDMI port is the main show on this device, the mini USB port and the microSD card slot serve as rounding out features, offering two connectivity options for camera and memory use. It’s plain to see that the MK802 II PC-on-a-stick is something worth having for those aren’t so attached to their computers. The good news is that owning the unit doesn’t have to cost a fortune. With a list price of $80, the Rikomagic MK802 II makes it tempting to switch to an attractively minimalist TV workstation setup. Now are you excited for this innovation or what? This entry was posted in Articles, USB Devices, USB Future, USB Gadgets, USB Technology, USB Tuner and tagged MK802 II, MK802 II PC-on-a-stick, PC on a stick, Rikomagic, Rikomagic MK802 II, Rikomagic MK802 II PC-On-A-Stick, USB dongle devices. Bookmark the permalink.